once and a while occurrence but lately they have been going out and not coming back on. only a matter of time before they quit working all together. Is this a major electrical issue? Is it fixable with moderate time and finance? yes electrical issue and is in the wiring, got to go thru each wire from fuse box to light it self. this is very time consuming and calls for alot of patients. I just talked to my mechanic and he thinks it might be the blinker relay switch. He said the hardest part of the fix is locating the switch. Does this see plausible? If so were would the switch be located? it is possible, it would be located in the fuse box or relay box under the hood . check your owner Manuel..
Hi, I ordered replacement headlights for the ford thunderbird 1994 but I can't figure out how to get the old ones out...any suggestions/help would be appreciated! How do you replace the trunk lock on a 1994 Thunderbird ? Start a new Ford Thunderbird question. Looking for a Used Thunderbird in your area? 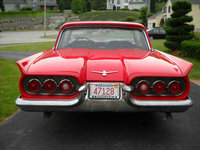 CarGurus has 1,031 nationwide Thunderbird listings starting at $5,950.